Tales From the Terminals now moves onto one of London’s most celebrated examples of architecture- St Pancras Station… or, as it’s been known since 2007, St Pancras International. It is all too easy to confuse ‘Pancras’ with the word, ‘Pancreas’… i.e., the gland organ which forms part of the digestive system! In fact, St Pancras takes its name from a derivation of ‘Pancratius’; a 3rd century martyr who was born in Phrygia (now part of modern-day Turkey). Orphaned at an early age, Pancratius was taken under the wing of his uncle, Dionysius. The pair decided to travel to Rome and, whilst there, they converted to Christianity; a dangerous thing to do in those days. Even more daring, Pancratius and Dionysius publically proclaimed their faith… an act of bravery which quickly led to their arrest. Dionysius died in jail and Pancratius- aged only 14- was beheaded for his beliefs. The two early Christians later gained martyrdom and were made into saints. It is believed that a church dedicated to St Pancras the Martyr has existed in the vicinity where the railway station now stands since the 7th century. St Pancras Station dates back to 1863, when the Midland Railway decided to construct a terminal of their own. Up until that point, they’d shared space with The Great Northern Railway; based next door at Kings Cross Station. With their plans for a new station in mind, bosses from the Midland Railway purchased land in the area known as ‘Agar Town’ which came under the parish of Old St Pancras church. The land upon which Agar Town stood had once been open fields, belonging to wealthy landowner, William Agar. 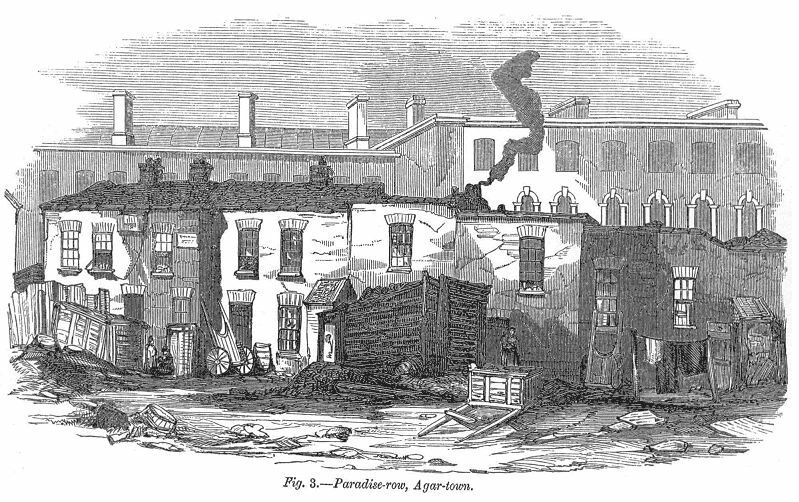 When William Agar died in 1838, his widow began to lease the land at cheap rates… as a result, Agar Town- essentially a shoddily built shanty community, began to spring up. When construction of St Pancras Station and its sprouting rail tracks began, Agar Town, being inconveniently in the way, required complete flattening. Although the landlady received a handsome £19,500 through the sale of the land, the residents of Agar Town- of whom there were approximately 5,000- were unceremoniously kicked out with no compensation offered. The demolition of St Luke’s- an Agar Town church- was also required but, being rather pious people, the Victorians re-built the place of worship a little further north in Kentish Town at a cost of £12,000. The relocated church still stands today, and can be found on Osney Crescent. The disruption didn’t end there though. Old St Pancras Church also lay very close to the worksite, and the need to dig a tunnel near the new station caused major disruption to the church’s graveyard. The cemetery belonging to Old St Pancras was the final resting place for 1,000s of people (many of whom had been refugees. who had fled to London during the French Revolution) and, although it had been closed to burials for some 30 years, there was public outcry at the railway’s interference with the burial ground. Many of the bodies had to be exhumed and re-buried but, rather than giving the corpses fresh plots, the authorities simply dug a 40 ft. deep pit, into which 7,000 cadavers were hastily placed. One of the officials employed to oversee this morbid task was none other than Thomas Hardy- a young apprentice architect who later went onto become one of Britain’s most celebrated authors; penning novels such as The Mayor of Casterbridge, Jude the Obscure and Tess of the d’Urbervilles. Today, the burial pit has been built over and, perhaps quite appropriately, St Pancras Coroner’s Court now sits on top of it. A number of tombstones from the torn up graves were retained by the Victorian planners, and grouped around a tree. This memorial of sorts is known as ‘Hardy’s Tree’ after the famous author who unhappily took part in the desecration. By 1868, St Pancras Station was ready for business. The new station was a true marvel of Victorian engineering, frequently drawing comparisons to a cathedral. 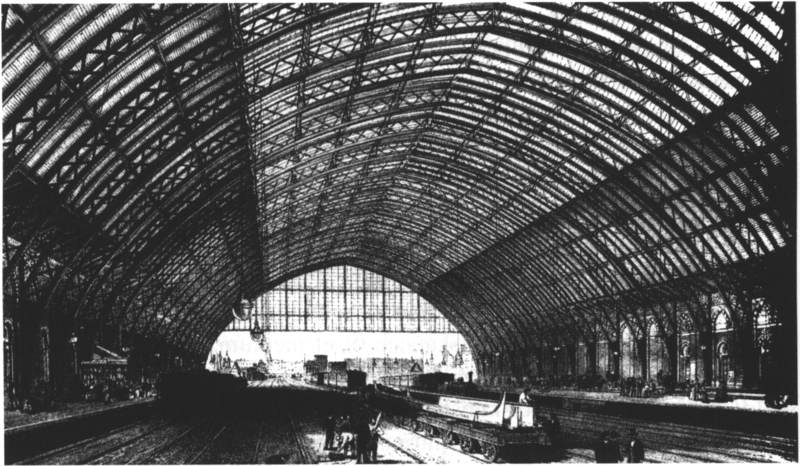 The Midland Railway’s directors had clearly done their homework; taking note of earlier stations and incorporating the best bits from them into their own terminal… the grandeur of old Euston, the soaring iron and glass roof at Paddington and the practicality of Kings Cross all played their part in influencing St Pancras. The mighty roof of the train shed was designed by William Henry Barlow, a seasoned engineer who had been involved in many projects- including the task of completing Bristol’s Clifton Suspension Bridge following Isambard Kingdom Brunel’s death. Barlow’s roof is 210 metres long, 73 metres wide and sits 30.5 metres above the rails; all supported by hefty iron ribs weighing 55 tonnes a piece. When it first opened, this breath-taking canopy boasted two records; being both the largest single span construction and the largest enclosed space in the world. Believe it or not, St Pancras station owes much of its immense size to… beer! When the station was built during the 1860s, ale brewing was big business. One of the major centres of this industry was the midland town of Burton-on-Trent, which had forged close links with the Midland Railway. So huge was the industry in Burton-on-Trent, that the town’s brewers built their own, private railway specifically for moving their product around. As part of this system, the brewers secured storage space at St Pancras; the new station being specifically designed to incorporate a vast network of cellars for the purpose. At its height, the vaults beneath St Pancras were able to store over a million barrels of booze, most of which went onto be shipped all over the world. St Pancras’s main façade, which faces the Euston Road, is in fact a hotel; the Midland Grand (now called the St Pancras Renaissance). It was built between 1868-1872, following a competition held by the Midland Railway to find an architect for the ego-boosting project. The contest was won by Sir George Gilbert Scott (father of Giles Gilbert Scott who followed in his father’s footsteps; becoming an architect and designing the iconic red telephone box, Battersea Power Station and the Bankside Power Station which now houses Tate Modern). It is perhaps surprising that Scott’s design proved victorious- because, out of the 11 plans entered, his was by far the most expensive! However, it was no secret that the Midland Railway were out to impress. They wanted their new combined hotel-station frontage to be the biggest and boldest in the British Empire. Their wallets were deep and cost was no object. Much of Scott’s soaring gothic design for the Midland Grand Hotel was actually based upon plans which he’d originally drawn up for Government offices in Whitehall. When the Midland Grand opened its doors in 1873, it was with the boast that the hotel was “the most perfect in every possible respect in the world”, and it did indeed remain at the height of luxury for the remainder of the century. The hotel was a hive of mod-cons, including flushing toilets, electric bells, hydraulic lifts (or ‘ascending chambers’ as the Victorians liked to call them) and Britain’s first revolving door. In 1896, a ladies’ only smoking room was opened at the hotel… this liberal move proved rather scandalous at the time, as giving the ok for women to have a puff in public just wasn’t the done thing! By the 1930s, the opulent hotel had become sadly outdated. The main reason for its faded eminence was that the hotel had been constructed in an era when en-suite bathrooms were unheard of. As the twentieth century wore on, concerting guests at the Midland Grand were still having to ask for jugs of hot water to be brought to their room; a once gentlemanly custom which had rapidly become uncomfortably outdated. The management introduced more gimmicks- namely an in-house orchestra and Moroccan style coffee room- in an attempt to boost the flagging numbers, but they were fighting a losing battle. Unable to incorporate the required plumbing or space for en-suites, the hotel closed down in 1935. The hotel building was later renamed ‘St Pancras Chambers’, and was converted into office space for use by British Rail. 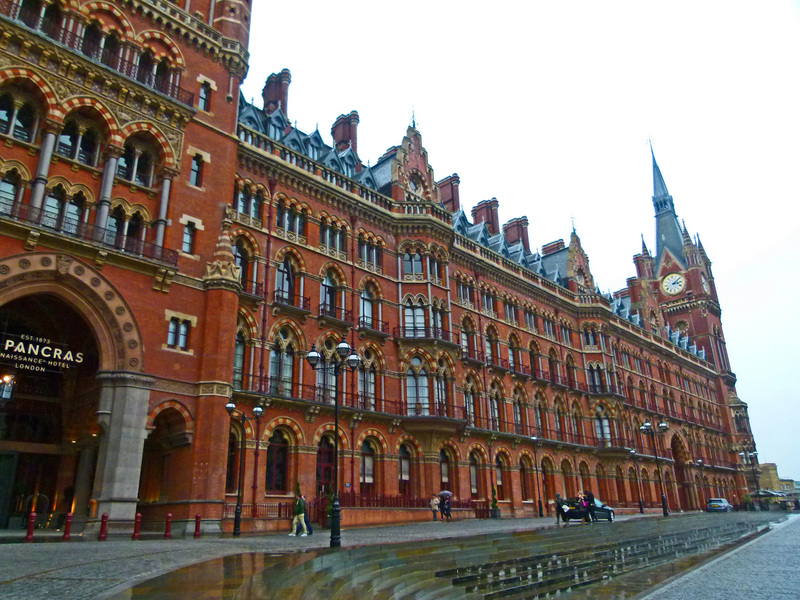 Despite the hotel’s closure, St Pancras Station continued to play its part as an important railway terminal. During WWII, the station was a major departure point for both troops marching off to war and for 1,000s of London youngsters being evacuated to the safety of the countryside. In August 1942, the station was heavily bombed; badly damaging tracks, rolling stock and the once magnificent roof. But, in the typical wartime spirit, it did not take long for railway workers to get St Pancras up and running again. Whilst the 1960s gave much to the world in terms of music, fashion and social advancements, its record on architecture leaves much to be desired. As mentioned in a previous post, the old, Victorian Euston station, along with its much celebrated Doric Arch, had been smashed to pieces in the early 1960s. As work got under way building the new, somewhat boxy Euston, nearby St Pancras was the next grand railway terminal to swing into the developers’ sights…. Planners from the mid to late 20th century were a ruthless, unsentimental bunch, with little time or appreciation for Victorian architecture. St Pancras Station was regarded in such circles as a vulgar, over-blown building from a bygone era which warranted wiping out. As with Euston Station, it was agreed that the old St Pancras should be demolished and replaced with structures of the utmost modernity. The plan envisioned sweeping away Scott and Barlow’s masterpiece and plonking a towering office block, leisure centre and social housing on the vacated site; a development that would not have looked out of place in Soviet Moscow. As part of this plan, the routes running into St Pancras would have been re-directed to next door’s Kings Cross, also earmarked for a major overhaul. Thankfully, St Pancras found a saviour in the form of Sir John Betjeman, the noted writer, broadcaster and poet laureate from 1972 to 1984. Born in Highgate, North London in 1906, Sir John Betjeman was a strong advocate of Victorian architecture and its preservation; a passion which, in the 1960s, seemed to be something of a lost cause. Sir Betjeman had campaigned to save Euston and the Doric Arch in the first half of the decade but, despite popular support, had sadly failed. In 1966, a British Rail employee who shared Betjeman’s love of Victorian architecture, leaked the proposed but hushed St Pancras demolition plans to the writer. The act of kindness from this mysterious benefactor granted the writer and his contacts at the Victorian Society valuable time to mount a large campaign to rescue the station from its fate. Sir Betjeman branded the demolition plans a “criminal folly” and the campaign he fronted involved the constant insistence to bureaucrats that the station had a special place within the hearts of Londoners. The station was saved when the government bowed to pressure and blessed St Pancras with a ‘Grade 1’ listing, thus making it untouchable.